Sauteed jumbo shrimp scallops. And imitation crab meat, stir-fried with mixed vegetables m a white wine sauce. 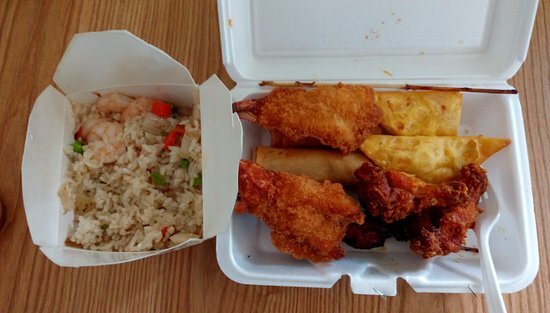 Two dishes in one-tangy shrimp and general Tso's chicken. Marinated‎ boneless chicken, quickly fried until crisp, then sauteed with special sesame sauce. Sliced chicken with chinese vegetables and mushrooms in a home style white sauce. Was looking on web and deiced have my lunch Chinese food delivery today , food is tasty and yummy loved it ! I probably won't go back. DO NOT ORDER FROM HERE!!! Terrible customer service! Sweet n Sour chicken was a bit over cooked (coating was perfect, though). Could offer a few more gluten-free options, especially the Young Chow fried rice, by using rice soy sauce. A bit pricy for the quality/taste. A great Chinese restaurant where the food is excellent, fresh, consistently made, priced realistically and plentiful. There had been some period of wait staff issues but they seem to be over. The servers are friendly and attentive. An excellent meal at a fair price. Get quick answers from Wai Wai staff and past visitors.